Since 2005 I have been searching for a gluten-free Paleo Sandwich Bread. I’ve blended flours, ground my own rice and corn, and used ground beans as bread ingredients. None of them ever came anywhere close to being something edible. Until now. 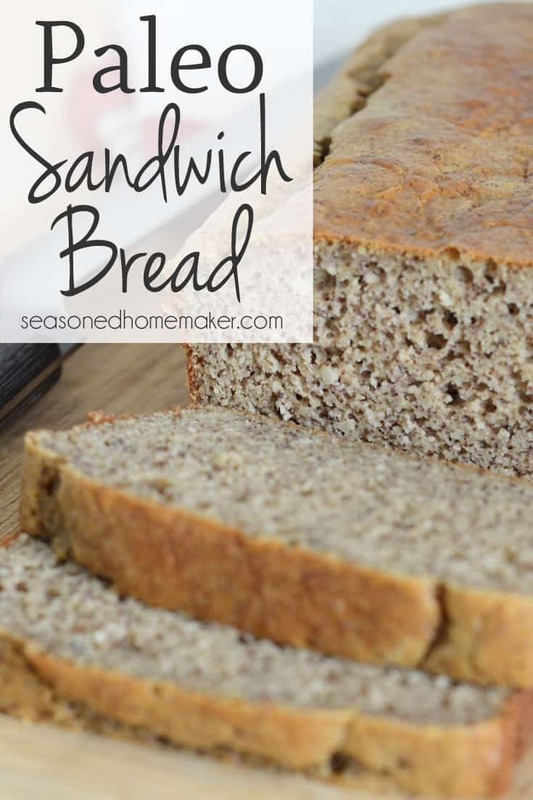 Recently, I purchased Danielle Walker’s book, Against All Grain and tried her sandwich bread recipe. Finally, a bread that is moist, doesn’t dry out in five minutes, and doesn’t crumble into dust. Best of all, it is made from nourishing ingredients ~ and, that is what makes it so ideal. I made a few changes to the recipe in the book that I think give the bread a slightly different flavor but keeps the great texture. 1. The recipe calls for Raw Cashew Butter. This is reeeeaaallllly expensive. I had a jar of Almond Butter in my pantry and decided to use this instead. I am thrilled with the results. 2. The second ingredient I substituted was the Almond milk for milk kefir that I made. Milk kefir is slightly effervescent and has a sourish flavor similar to buttermilk. I was hoping to give my bread a little sourdough flavor. I am happy to report that this substitution was ideal. I love the slightly tart flavor to the bread. It helps with the sweetness from the almond butter. Preheat oven to 300-degrees. Place a small dish of water on the bottom rack while oven heats. Don't skip this step. It really helps with the bread rising. Line the bottom of an 8.5" x 4.5" bread pan w/parchment paper. Grease sides of pan w/coconut flour. Beat egg yolks and almond butter in separate bowl. Add in honey, vinegar, and milk. Sift coconut flour, baking soda, and salt into mixture. Blend well, but don't over beat. Add in ¼ C. of egg whites to mixture and blend until smooth. Add the remaining egg whites slowly and blend on low. Do not over mix. Pour batter into loaf pan and put into oven. Remove from oven and let sit for 15 minutes. Free bread from sides of pan and turn out onto cooling rack. Cool right side up at least an hour before serving. This post contains Affiliate links that may result in a commission. These commissions help pay for the cost of running this site and keeping the content free. My Full Disclosure Policy is available here. I confess to be burned enough by supposedly edible grain-free bread recipes that I’m skeptical. That being said, I’m looking forward to trying this recipe as hope still stirs in my heart! Thanks for sharing it with us. Keep in mind, the recipe from the book is pretty awesome, too. I love that this bread isn’t chewy or dried out! It’s the best I’ve had so far. Oh, this looks wonderful. Can’t wait to try it. I am especially excited with the idea of using milk kefir in this. Last year I discovered that I am sensitvie to peanuts and almonds (as well as being celiac). You said that cashew butter is expensive so, is there another alternate you would suggest? I may give this a whirl when my friend and her husband come to dinner. He has celieac disease. Would you consider posting your kefir method? I make alot of yogurt , cottage cheese, farmer’s cheese, quark and ricotta, but never kefir. I’d love to try it, and while I’m know there are copious posts on the web, I’d like to see how YOU make it. Thanks. Only 1/4 cup of Coconut Flour? I wonder if this is a typo? Does not seem nearly enough, but I’m very new to GF baking. Please confirm this measurement. Thanks very much! Nope. Coconut flour goes a long way. Any more and I would have a Paleo Sandwich brick! Thanks so much for your quick reply and educating me on the use of coconut flour! Do take out the water when you put the bread in the oven? Nope. It helps the bread rise and keeps it from burning on the edges. Absolutely! I usually use coconut sugar which is good for diabetics. But no sweetener works too. I baked this for 50 mins, cake tester was clean, but the inside didn’t bake at all. Hot mess and totally ruined. I live at a high elevation and this may have effected the results. Is a 300 degree F oven correct? I live practically at sea level and this has never happened to me. It might be the elevation. Yes, the temp. is correct. I slice mine then individually wrap each piece for freezing. Tedius, but it makes the bread last longer. I’m the only one in my household that uses it.